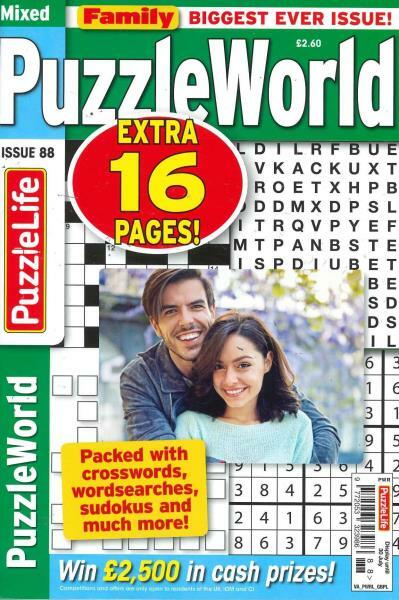 Puzzle World magazine;is the latest edition to the Eye to Eye Puzzles group of magazines, who currently publish the ever popular titles Lucky Seven Crossword Collection, Lucky Seven Wordsearch and Family Wordsearch Jumbo as well as others. Each issue of the magaizne will contain around 124 pages of mixed puzzles. Crosswords, wordsearch, criss cross, skeletons and arrowords as well as the many other puzzles you would expect to find in a mixed puzzle magazine. There will also be a chance to wincash with each issue. Be sure you dont miss a an issue and subscribe to Puzzle World Magazine today with Unique Magazines.